Okay, eenie meenie miney dead. George R.R. Martin is no stranger to killing off beloved characters. HBO’s Game of Thrones, and his A Song of Ice and Fire series that inspired it, are littered with the corpses of heroes, villains, and everyone in between. How did Martin become so comfortable with shocking his audience? Because when he was a kid, J.R.R. Tolkien did it to him. 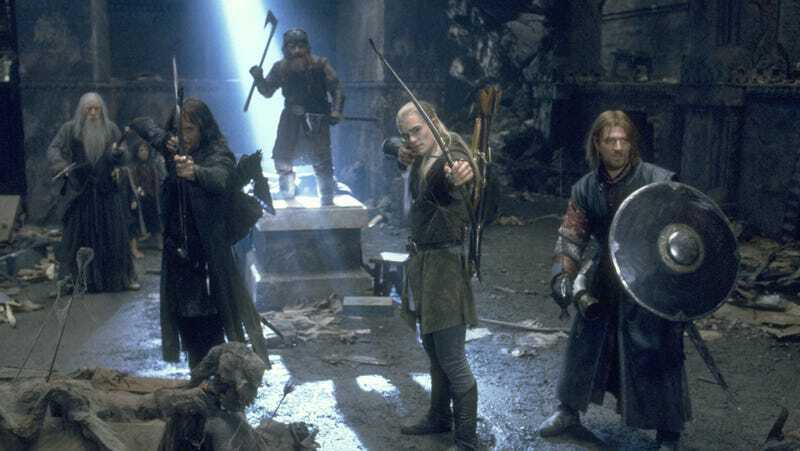 In a video to celebrate Game of Thrones being added to PBS’ “The Great American Read” collection, Martin chatted about how Tolkien’s Lord of the Rings series influenced his own fantasy saga through its expansive world and complex characters. Martin remarks on how he would use fantasy novels as a form of escapism when he was a kid, because he didn’t grow up with a lot of money. His favorite, by far, was The Lord of the Rings—even though, when he first picked it up, he was a bit put off by it. Eventually, the novel started to pick up the pace, and Martin said that by the time he’d reached the Mines of Moria he realized “this was the greatest book I’d ever read.” However, that admiration turned into shock and horror once a particular moment happened. You know the one I’m talking about. If not, I’ll let Martin himself explain it. And then Gandalf dies! I can’t explain the impact that had on me at 13. You can’t kill Gandalf. I mean, Conan didn’t die in the Conan books, you know? Tolkien just broke that rule, and I’ll love him forever for it. The minute you kill Gandalf, the suspense of everything that follows is a thousand times greater, because now anybody could die. Of course, that’s had a profound on my own willingness to kill characters off at the drop of a hat. It actually makes a lot of sense that Gandalf’s “Fly, you fools!” demise inspired Martin’s own murderous leanings. He’s never been afraid to kill off important characters, most notably patriarch Ned Stark (played by Sean Bean in the HBO series; coincidentally, Bean also played Boromir, who met his end in the first LotR movie). The show has followed in his footsteps with similarly shocking choices, like the death of Hodor in one of Game of Thrones’ saddest moments. What power that had, how that grabbed me. And then he comes back as Gandalf the White, and if anything he’s sort of improved. I never liked Gandalf the White as much as Gandalf the Grey, and I never liked him coming back. I think it would have been an even stronger story if Tolkien had left him dead. Currently, Martin is doing everything else besides finishing The Winds of Winter, including working on a Game of Thrones prequel series with Jane Goldman, anticipating the release of Syfy’s Nightflyers TV show, and developing an Ice Dragon animated movie that, sadly, has nothing to do with Viserion or his blue fire powers.